Swartz received a bachelor's degree in electrical engineering from The City College of New York and a Ph.D. in electrical engineering from Brooklyn's Polytechnic University, where he was the recipient of National Science Foundation and Ford Fellowships. He is a member of the HKN, TBPi and Sigma Xi Honor Societies. He has taught electrical engineering at both CCNY and at the Polytechnic, where he was the 1990 recipient of their Alumni of the Year Award. Dr. Swartz holds a dual Adjunct Professor appointment at Stony Brook University in the departments of Electrical & Computer Engineering and Applied Math & Statistics. Swartz represented high tech companies at the 1986 conference co-sponsored by the White House and the Department of Education to stimulate minority opportunities in technology. He is a board member at Stony Brook University and Polytechnic University, and a trustee at Cold Spring Harbor Laboratory and at the University of California at San Diego. Swartz received the 1990 Tech Island Award from the IEEE for "Turning Ideas into Reality," and was the 1995 IEEE Wheeler Award winner. In 1996, he was named an IEEE Fellow, that organization's highest technology honor. 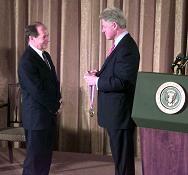 In 1998, Swartz received the IEEE's prestigious Ernst Weber Leadership Award for career achievement, and in 2000 he was honored with an IEEE Third Millennium Medal for outstanding technical achievement. Also in 2000, Swartz was elected a member of the National Academy of Engineering for "Distinguished Contributions to Engineering." In 2001, he was awarded the first annual Eureka Award by the New York Academy of Sciences. Swartz served as the project manager on NASA’s Apollo Space Radiation Warning System program. He then ran an independent consulting firm with projects ranging from Space Shuttle experiments to specialty lens design, aircraft collision avoidance systems, patient monitoring electronics and the design of a computer-automated camera for producing UPC bar code film masters. He went on to co-found Stony Brook Applied Research, which was later renamed Symbol Technologies. Swartz patented and led the development of the first hand-held barcode laser scanner, a data capture productivity tool now common in myriad applications across diverse global markets. Under his direction through the 1980s, Symbol also pioneered and patented the world's first hand-held, scanner-integrated wireless computer and the first spread spectrum wireless LAN (WiFi), enabling real-time mobile data-transactions. He also led the development of the first commercially accepted wearable computer, which combines a ring scanner worn on the finger and a wireless LAN-based, wrist-mounted computer for handling-intensive barcode & voice over IP applications. Swartz patented and was instrumental in the development of PDF417, the high capacity, two-dimensional bar code symbology that encodes more than a kilobyte of machine-readable data in a postage stamp-sized symbol. He also patented and drove the development of the portable shopper self-checkout system, which allows customers to scan their own items in the aisles as they shop, to bypass traditional checkout lanes. Swartz is a recognized expert in the allied engineering physics fields of electro-optics, laser systems and optical design, with particular application to new product development. He is credited with more than 200 U.S. patents and is the author of some 30 published papers. In 1994, Swartz established the non-profit Swartz Foundation for Computational Neuroscience (www.theswartzfoundation.org), to explore the application of mathematical physics and computer engineering principles to traditional neurobiology, as a path to better understanding the brain/mind relationship. The Foundation supports a number of research initiatives at five Sloan/Swartz Centers for Theoretical Neurobiology (Salk Institute, CalTech, UC San Francisco, NYU/Courant and Brandeis) and Swartz Centers for Computational Neuroscience at the UC San Diego, Cold Spring Harbor Laboratory, Columbia University, Princeton University, Yale University, and Harvard University, which together form the nucleus of Foundation activities. Dr. Swartz considers his 3rd place boys ranking among ping pong players on the East Coast of the United States in the late 1950s to be among his greatest accomplishments. Now part of Motorola, the former Symbol Technologies got its start when Jerome Swartz and Sheldon Harrison started selling bar code masters that corresponded to the newly standardized Universal Product Codes (U.P.C.). There are few technologies that have had so much impact on the lives of consumers worldwide as bar codes have. The technology is inexpensive and easily connects physical objects to information systems. This Scholarpedia article outlines the theory and technologies behind bar code scanning. The article is by Emanuel Marom, Department of Electrical Engineering Physical Electronics, Tel Aviv University, Israel; Satya Sharma, Mechanical Engineering, SUNY Stonybrook, NY, USA; and Jerry Swartz, The Swartz Foundation. that occur to him while daydreaming. What actually happens in the brain when an idea suddenly “pops up”? is subjecting the phenomenon to serious research. Symbol Technologies Conference Presentation, January, 2000.